HOT CROSS BUNS FOR EASTER!! Hot Cross Buns! 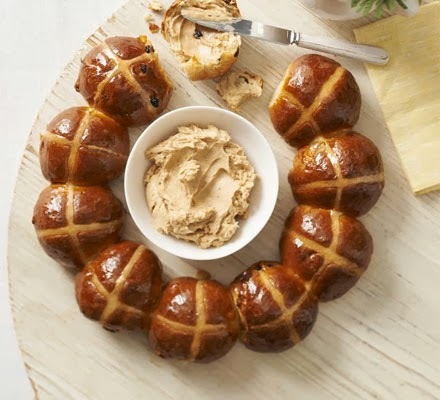 Hot Cross Buns! One a Penny, Two a Penny! Hot Cross Buns! Warm the milk and orange zest in a small saucepan until steaming. Remove from the heat and add the butter, swirling the pan until the butter has melted and the milk has cooled to hand temperature. Mix the flour, cinnamon, sugar, yeast and 1 tsp salt in a large bowl. Pour in the milk mixture and the beaten egg, and mix with a wooden spoon until the mixture clumps together. Tip out onto your work surface and knead until smooth and elastic – the dough should bounce back when pressed with your finger. Transfer to a clean oiled bowl, cover with cling film or a tea towel and leave to rise for 2 hrs or until doubled in size. Dust your largest baking tray with flour. Tip the dough back onto your work surface and knead again to knock out any air bubbles. Add the dried fruit and knead to incorporate into the dough. Divide the dough into 11 equal pieces. Roll each lump of dough into a smooth ball. Arrange the balls on your tray in a ring, leaving a small gap between each one. Cover loosely with a piece of cling film and leave somewhere warm to prove again for a further 1 hr or until doubled in size, the buns should be just touching. Heat oven to 180C/160C fan/gas 4. Brush the buns with a little beaten egg. Mix the remaining flour with enough water to make a thick paste, then transfer to a piping bag fitted with a small round nozzle, or use a sandwich bag and snip off one corner. Use the paste to pipe crosses over the buns – this is easiest if you pipe in one big circle, then put a line across the middle of each bun. Bake for 25 mins until golden and cooked through. Meanwhile, make the spiced honey butter. Put the butter, spices and honey in a bowl and beat with an electric whisk until smooth. Transfer to a bowl. When the buns are cooked, remove from the oven and leave to cool for 10 mins on the baking tray. Serve the bun ring warm with the butter in the centre for spreading. The buns will keep for up to 3 days in a tin or freeze for up to 3 months. Perfect to make for your holiday away from home over the Easter period. You can make a big batch before you set off on your journey to stay with us, or you can make them while you are here to give that lovely aroma around your caravan of fresh baking. This recipe would also be great if you are joining in the Great Whitby Bake Off! CELEBRATE ST PATRICK'S DAY WITH US! !